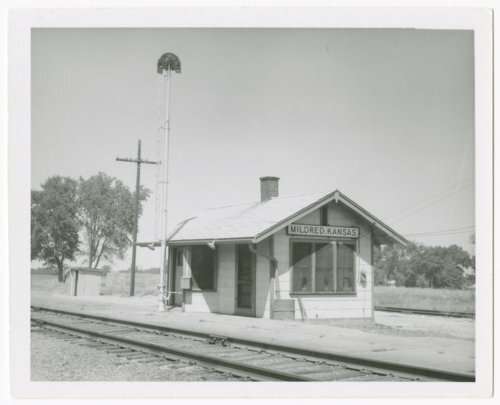 This photograph shows the Missouri-Kansas-Texas railroad depot at Mildred, Kansas. The one-story wooden structure was part of the Northern Division, KS. City Sub Division at milepost 87.0. The depot still stands and was relocated to the Pome on the Range Apple Orchard and Winery in Homewood, Kansas. Collections - Photograph - Killam, H.